E.K. 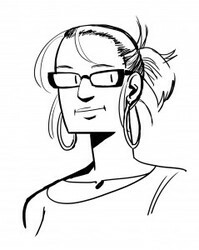 Weaver is the artist and author of The Less Than Epic Adventures of TJ and Amal, an independent comic about two strangers who make a deal to travel across the United States and end up growing close in the process. She has been working as an illustrator since 1997 and has been drawing comics since 2008. She currently lives in Austin, Texas, with her husband Brett, two big dopey dogs, and a cat who hates everything. TJ and Amal is available both in print and online at www.tjandamal.com.